A complete guide to the 18 best rooftop bars in LA in 2019. Find the best Los Angeles rooftops, complete with all info you need. Opening hours, dress code, photos, maps and much more. 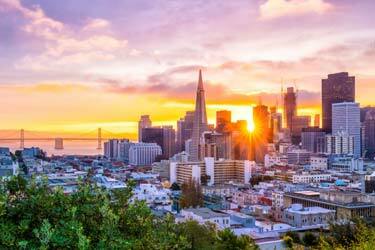 LA is one of the most popular cities to visit in the world. 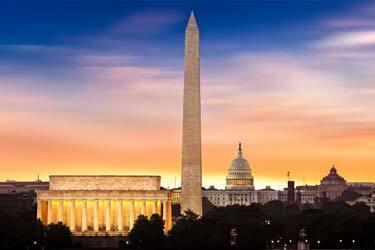 Much because of all the celebrities living here, but also for the fantastic vibe, trendy people and great climate. 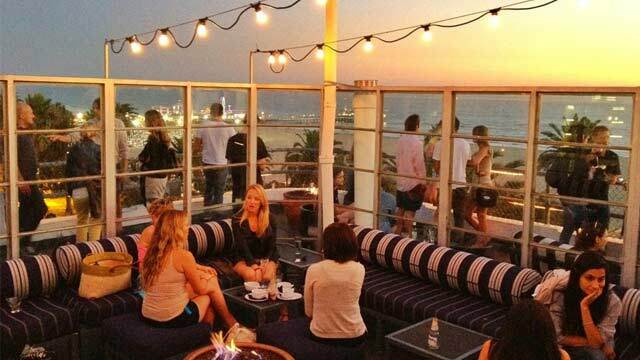 So, which is the best rooftop bar in Los Angeles? The roof terraces here are open all year long and many of them with fancy rooftop swimming pools. 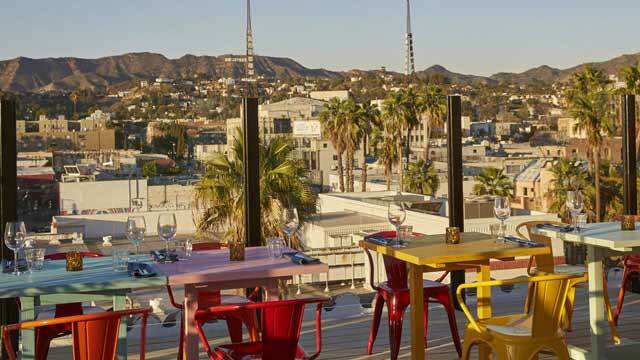 Just scroll down and find the LA rooftop bar best suited for you. Or use the LA rooftop map in the bottom right corner. 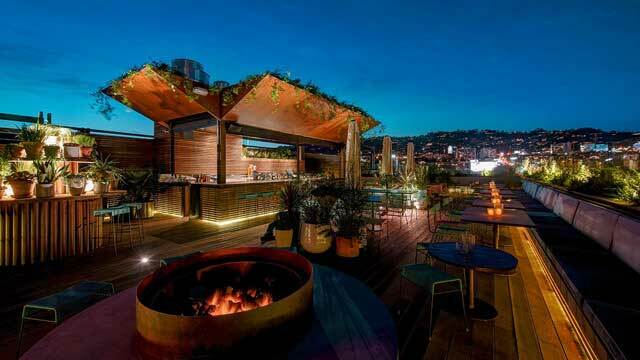 Popular Los Angeles rooftop bar and bistro, located in downtown LA with a magical view of the skyscrapers and skyline. The interior has a French bistro-feel and outside seating comes with alot of cozy fireplaces. Two levels, one floor restaurant / bar with inside and outside seating and one floor rooftop terrace, where only drinks are served. Mixed crowd and great atmosphere. 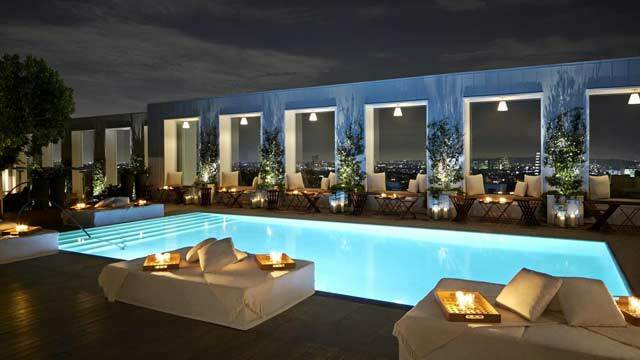 On this rooftop bar in Los Angeles you get stunning views over downtown LA and a large and lovely swimming pool. And, come night, one of LA's most hip and popular rooftop parties, with live acts and DJs several nights a week. The rooftop bar serves classic cocktails and bar bites and (if there is space) you can chose to sit in lounge sofas, waterbed pods or more regular tables. 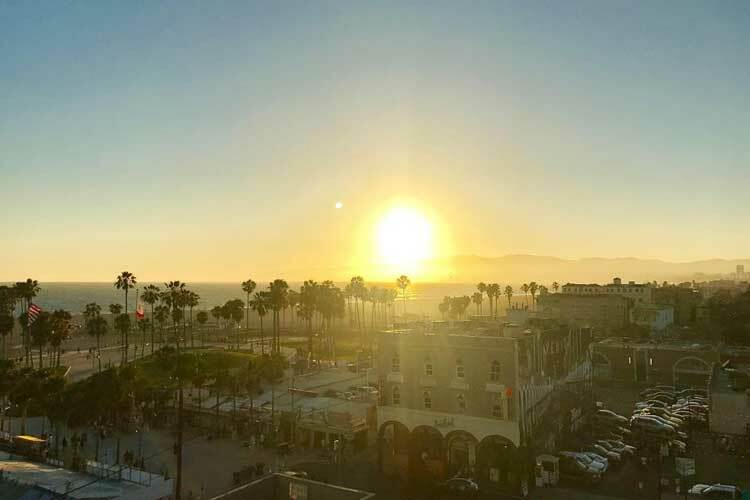 The only rooftop bar in Venice, and from this LA roof terrace you get a magnificent view of the Pacific Ocean and Venice Beach. Try to time a visit at sunset, which is almost out of this world. Lovely beach / lounge vibe on the terrace with a menu consisting of signature cocktails, Californian beers and tasty bar bites. And sunscreen. Trendy hotel in old 1927 movie building, with perfect location in downtown LA. Rooms range from small to 633 square foot suite, all with custom Revo Radio and many with an acoustic Martin Guitar. Public spaces include downstairs restaurant, rooftop pool and bar and a 24/7 gym. Other perks are free WiFi and valet parking, day and night. Perched on the 73rd floor of the InterContinental Los Angeles Downtown, Spire 73 is actually the highest rooftop bar in the Western Hemisphere, and also one of the highest in the world. 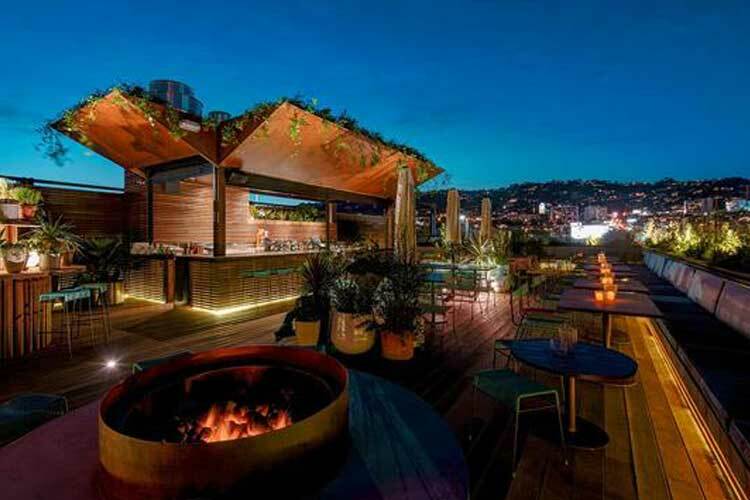 The roof terrace offers spectacular views over the entire Los Angeles along with cosy fire pits and an array of different and stylish seating options. Plus delicious signature cocktails. Here you find the highest rooftop swimming pool in all of LA. From this Los Angeles sky lounge you get a magical view of the Sunset Strip and Hollywood Hills. Live DJs on Saturdays and refreshing drinks all day long. Unfortuneatly only open to guests at the hotel. A Beverly Hills oasis, luxurious but relaxed rooftop bar with great service and a great view of Beverly Hills and the LA skyline. Open from early morning to late dinner, offering a large menu with a wide variaty of drinks and nutritious Californian cuisine. Plus summer weekend BBQs. Popular rooftop bar among both locals and visitors, with a fantastic rooftop pool for the hotel guests. A roof terrace in LA that market itself as "So much more than just a simple rooftop". And with the stunning views at display they might just be right. Rooftop bar with good selection of drinks all days, rooftop restaurant on weekends. Colorful decor with large lounge sofas, hip and casual vibe, perfect for view-gazing cocktails with friends. 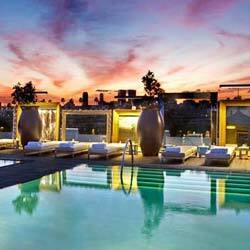 The LA flair is best enjoyed at one of the cities great rooftop pools. 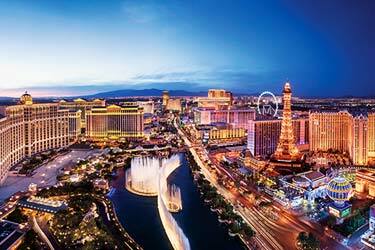 Dive into our list of the very best ones and enjoy dazzling city views and refreshing water. One of the largest roof terraces across Los Angeles. From the L.P. rooftop bar you get a lovely view of the Hollywood Hills, along with creative hand-crafted cocktails and Asian inspired street food. This is all served in a vibrant and lovely atmosphere, perfect for mingling with friends. In the same building you also find the E.P. 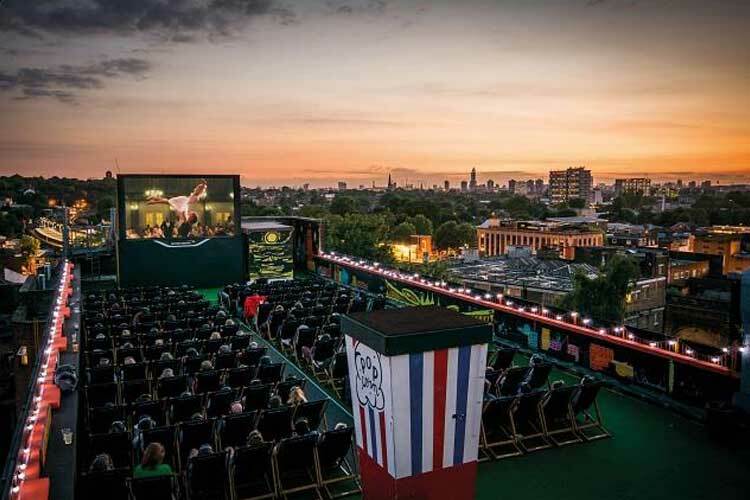 Asian Eating House and Melrose Rooftop Theatre. Sky Bar is really the rooftop bar in Los Angeles to visit if you want feel the pulse and Hollywood glamour. Newly re-imagined design to the terrace, but the same old fantastic view of the LA skyline. And the same amazing rooftop pool. Poolside lounge by day and one of the hottest party spots by night. Dress for succes and enjoy a wide range of drinks and bar bites, along with a real Hollywood vibe.
. 360 views of the Hollywood Hills and a range of different rooftop spaces, like a fantastic saltwater rooftop pool, a firedeck and a hummingbird & butterfly garden. Just to name a few. 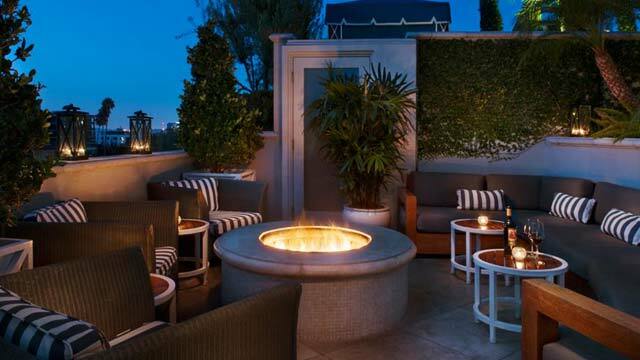 The perfect LA rooftop for a romantic getaway. 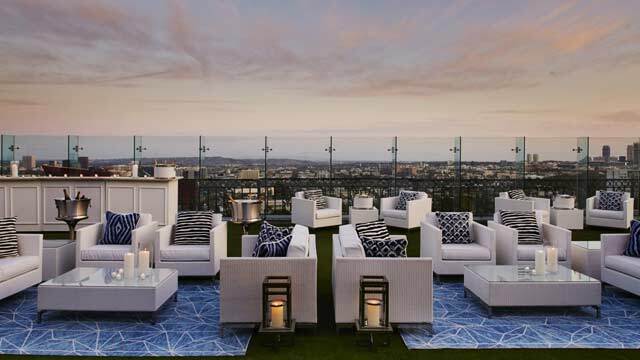 At The London West Hollywood you find Boxwood on the Roof which is both a rooftop cocktail lounge and dining space, with sweeping views over Hollywood and the LA skyline. Stylish and modern, with New American cuisine, handcrafted cocktails and weekly events like Sunday brunch. 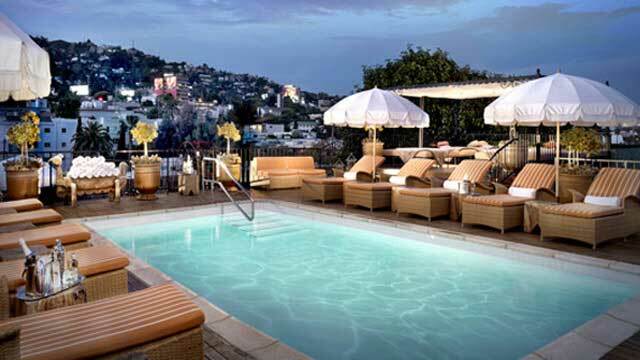 For hotel gusts the terrace also holds one of LA's best rooftop pools. A short walk from Rodeo Drive you find this gem. A fantastic cocktail lounge, offering one of the best 360 views of Beverly Hills available along with both food and drinks from the rooftop bar. All from small bites and full meals to sunkissed coktails. Great vibe and one of the best rooftop pools LA has to offer, open to hotel guest or at one of the pool parties arranged. 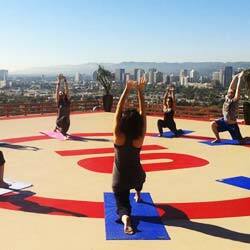 Check out our list of the best Los Angeles rooftops to do yoga with a view! Combine inner peace with dazzling city views. 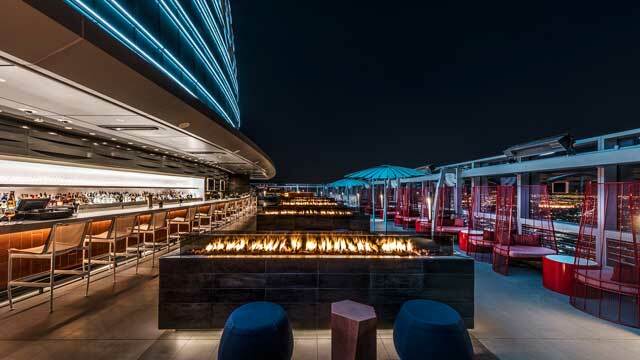 A very luxurious, but still price wise reasonable, rooftop bar in Los Angeles. The view from the 6th floor is fantastic over Beverly Hills and Los Angeles, with a sunset that is absolutely amazing. Only open for hotel guests and those opting to book a cabana. Here you find one of the best rooftop pools Los Angeles has to offer and a wonderful, realxing atmosphere. 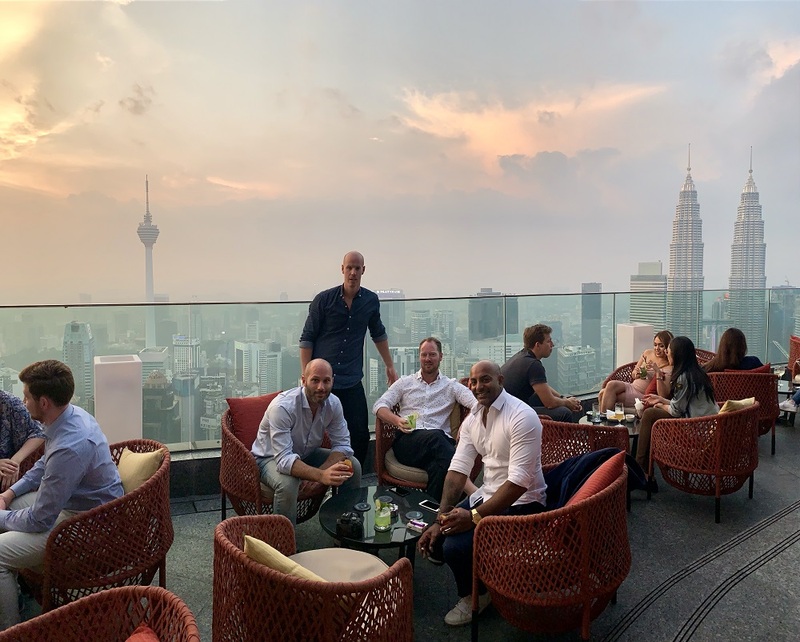 Perched on top of the 5-star hotel you find this very luxurious and modern rooftop bar. Location right in the Los Angeles city center, neighbour with Microsoft Theater and Staples Center. The terrace is equipped with both heated rooftop pool and jacuzzi, and the 360-views of downtown LA are amazing. Only open to guests at the hotel, but non-residents can check out the WP24 indoor restaurants on 24th floor. Located between downtown Los Angeles and Beverly Hills, The Roof on Wilshire is a lovely rooftop bar with amazing 360-views over the city, Hollywood Hills and Beverly Hills. The terrace is equipped with a great swimming pool, large and comfortable lounge chairs and cabanas. 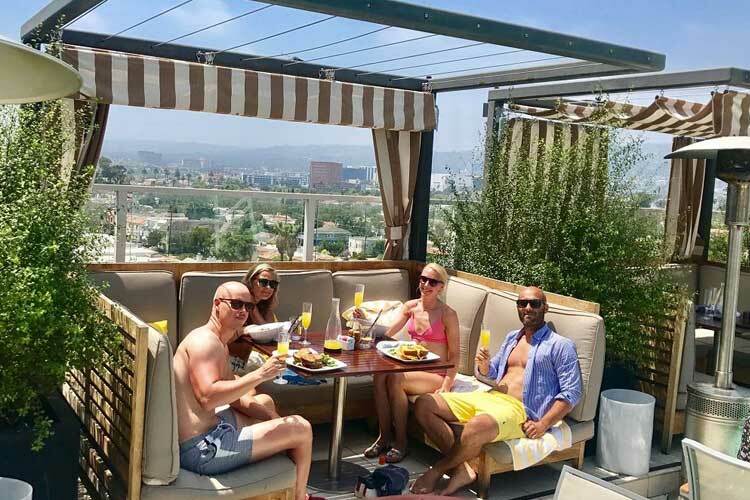 Throoftop bar is open all day for breakfast, lunch and dinner, perfect for both a long day in the sun and a more cosy evening setting with dinner under the LA stars. 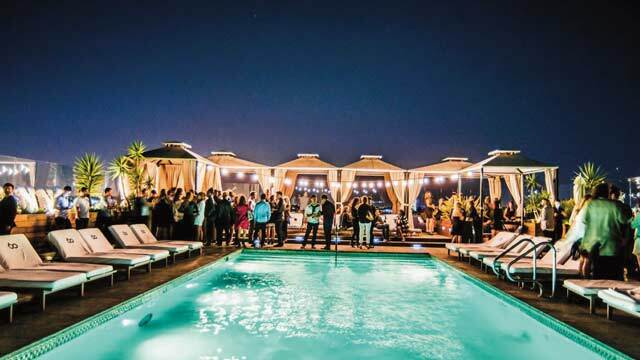 Get your party pants on and check out our list of the best rooftop parties in LA. Some amazing party spots with dazzling city views, perfect for a night out in the city of angels. 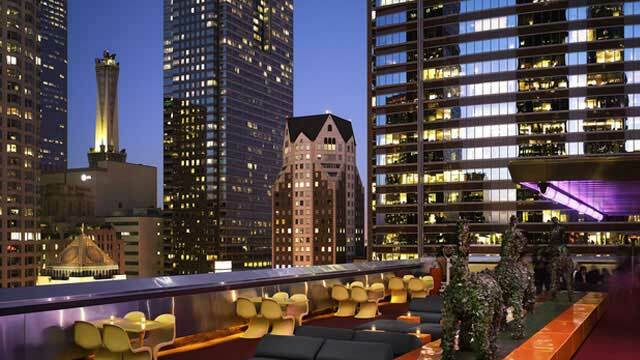 A trendy and vibrant rooftop bar with a magnificent view of downtown Los Angeles and the surroundings. Really an urban oasis right in the city center. Two terraces, one 'bar-part' with seating areas and tables and one 'pool-part', bathing in sun equipped with a lovely rooftop pool and some comfy sun loungers. Poolside lounge during day, come night an eventfilled rooftop bar with the hip crowd of LA mingling into the late hours. 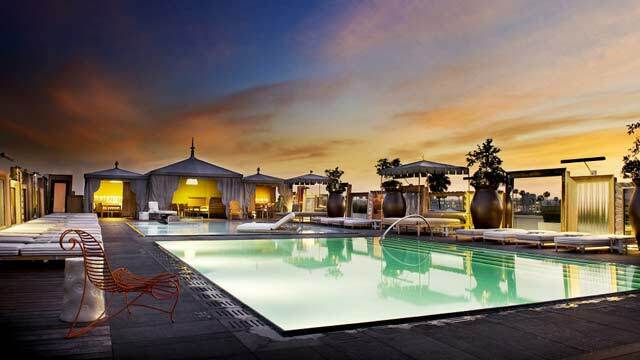 Located at W Hollywood, this rooftop bar in Los Angeles offers a stylish rooftop pool and stunning views over LA and Hollywood in a luxurious setting. Only available to hotel guests or by reservation of a sunbed or one of the private luxury cabanas. This is the rooftop to visit if you want that true poolside Hollywood-feel, surrounded by luxury, good atmosphere and and a great view. Discover the biggest collection of Los Angeles activities, guided tours and skip-the-line tickets. Anything you want you'll find right here. The climate in LA is pleasant all year round, which makes the city an ultimate city for rooftop bars. 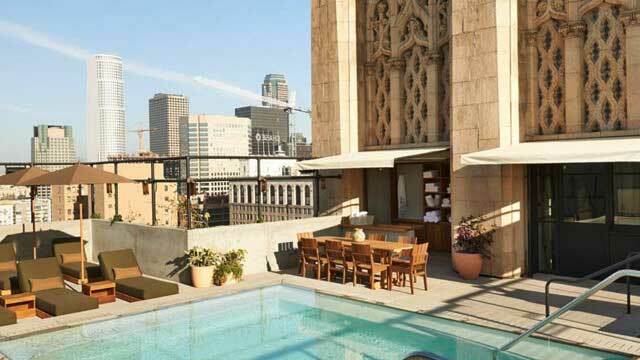 Which are the best rooftops in LA? 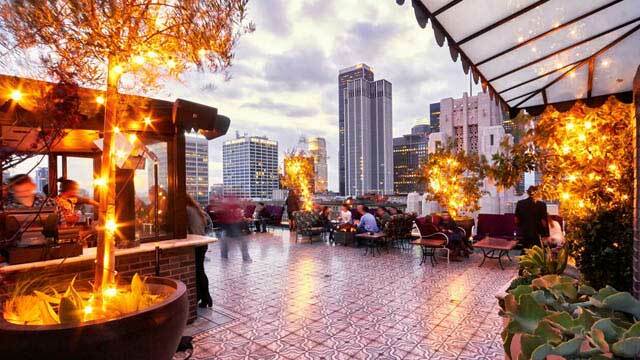 There are lots of good, luxurious and cozy rooftop bars here in LA. The roof terraces often have magical views and also good service food and beverage. Regarding Los Angeles rooftop bars, they are very scattered geographically. Some are located downtown in the center, some perched in the Hollywood Hills, and a portion from the coast at Santa Monica or Venice Beach. There are lots of roof terraces in LA and it keeps popping up new ones every year. 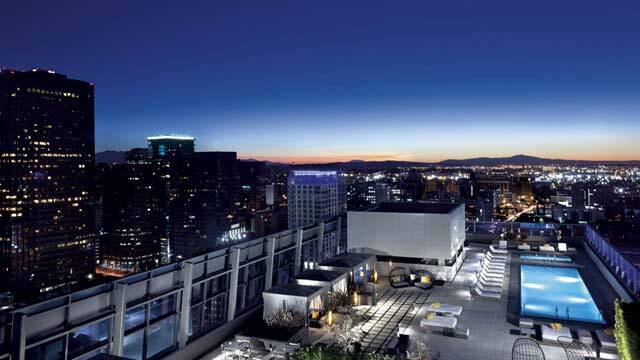 Keep an eye on our website to find the most accessible and best rooftop bars Los Angeles has to offer. On the map you'll easily find your way among the best sky lounges available here. Los Angeles rooftop bars has never been easier to find. Los Angeles is America's second largest city and capital of the State of California. 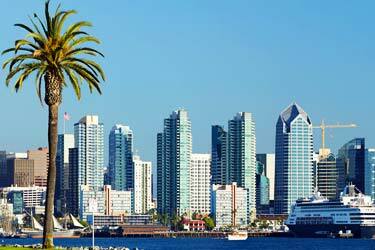 The city was founded by the Spaniards, as the name suggests, Los Angeles which means "the angels" in Spanish. A common nickname for the city is otherwise LA and the inhabitants are called "Angelenos". LA has a lot of famous universities and is also a world leader in television, film and music industry. The city is teeming with famous neighborhoods like Beverly Hills, Hollywood, Bel Air, Venice, Long Beach and many more. LA is the perfect city when it comes to party on rooftop bars. Here there are a numerous of roof terraces that hosts cool parties. 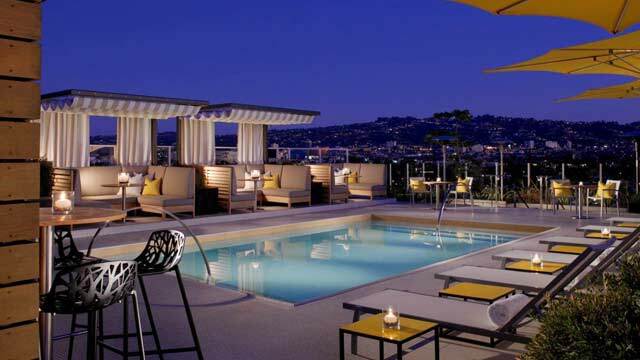 Most of the rooftop bars in LA who organizes parties also have access to luxurious swimming pools, as well as large and comfortable lounge areas. Many celebrities comes to party at rooftop bars in Los Angeles. Most common in the glasses on the roof terraces in LA is cocktails, bubbles or beer. For those who like dining, there isn’t a huge range of roof terraces with restaurants. Most often they serve classic bar-bites or snacks here. More focus on the atmosphere, the lounge feeling and the party feeling among the rooftop bars in LA. There are both rooftop bars at low heigt and at very high altitude in Los Angeles. Everything from the top of the skyscrapers to the second floor in some smaller hotels. The best views you get from the roof terraces up in the Hollywood Hills. Here, a roof terrace on the second floor provide a fantastic view of the entire Los Angeles skyline and its surroundings. 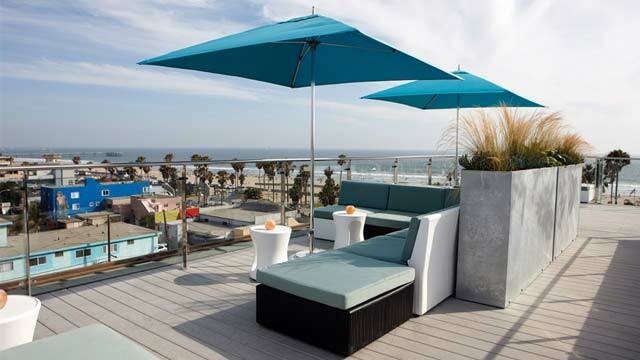 Some of the rooftop bars in LA can also boast with fine sea views and beautiful views of the beaches along the coast. That said - there are several different kinds of prospects. All charming in its own way. Los Angeles has the luxury of having all the ingredients needed to be the perfect big city. Here there are beautiful beaches, great surfing, awesome shopping, one of the world's best nightlife, fantastic restaurants, great bars, some of the world's best rooftop swimming pools, shows, Disneyland, amusement parks and much, much more. For those who are interested in sports, there are the of course something for everyone here, too. Basketball, hockey, football, soccer, baseball and so on. Los Angeles can also boast the world's most famous film industry - Hollywood. The place is swarming with celebrities and wealthy people. 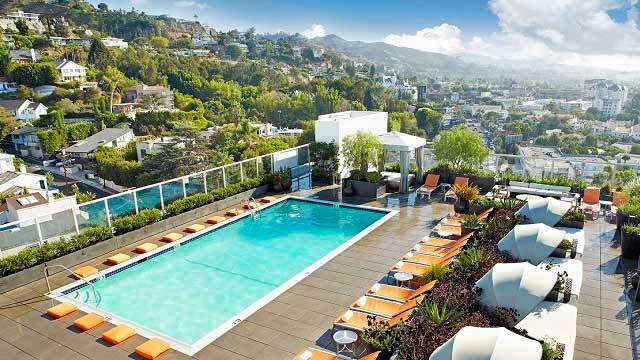 Los Angeles is a true mecca when it comes to rooftop swimming pools. The city absolutely teeming with rooftop swimming pools - both at hotels or private belonging restaurant or rooftop bars. 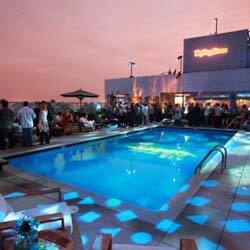 It is also common to have a pool party at the rooftop pools in LA. The warm year-round climate makes the city's rooftop swimming pools to stay open almost the entire season. Unfortunately, there are no infinity rooftop pool available, but more of the common rectangular swimming pools with magnificent views of LA and its environs. 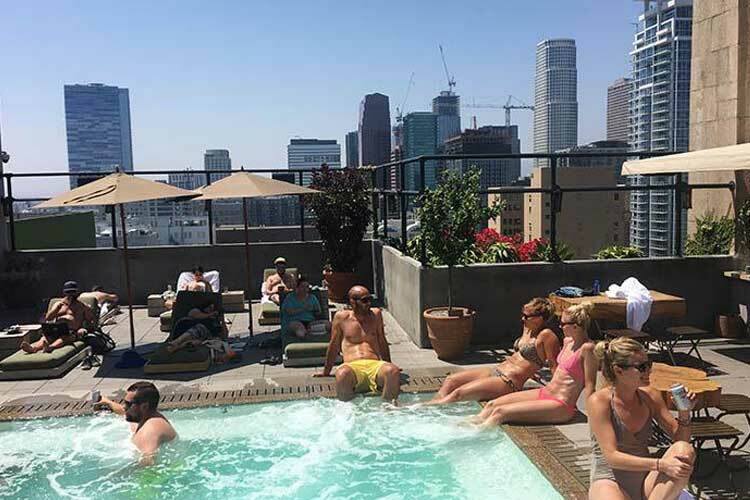 Do you want to get the maximum out of your visit among rooftop bars in Los Angeles then you should book your hotel with a rooftop pool directly from us. 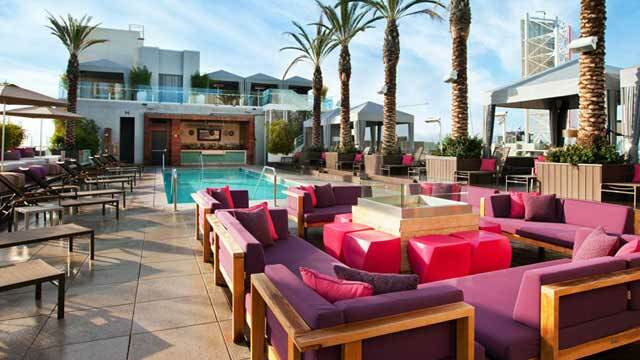 Then you are guaranteed a place at one of LA's luxurious and stylish rooftop swimming pools. LAX is one of the world's most famous and largest airports. LAX has air service to almost all parts of the world. And the fact that the airport is located near Los Angeles city center doesn’t make it worse either. With both taxi and bus you can easily get to and from LAX. 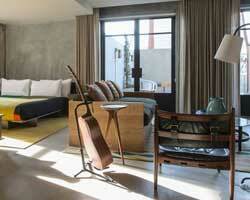 And for those who really appreciate a good hotel, there are plenty of truly amazing hotels in LA. Many of them have some of the best roof terraces in all of Los Angeles. On the more luxurious hotels, there is often a rooftop pool that can be utilized pretty much throughout the year. If you like party and rooftop swimming pools, Los Angeles is the city you should visit.